Our living and working environment is affected by globalization and internationalization. Hence, the ability to effectively communicate and interact with others in intercultural settings has become a necessity. Intercultural competence is widely considered one of the key skills needed to succeed in ever more diverse societies and workplaces. Still it is one thing to acquire intercultural competence, but it is quite another to pass it on to others. It requires extensive knowledge and skills. This is what the Intercultural Trainer Academy will equip you with. The Intercultural Trainer Academy is an intensive 10-day program which offers the opportunity to become an intercultural trainer. It is organized twice a year in January, organized by InterCultur and Jacobs University, and in August, organized only by InterCultur. 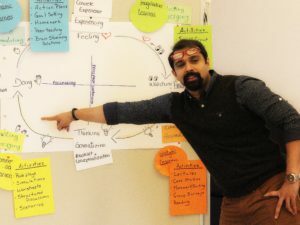 The Intercultural Trainer Academy offers a unique blend of theory and practice tailored to your individual needs and interests. Theoretical input from intercultural scholars will be complemented by insights from lecturers and practitioners of InterCultur and Jacobs University Bremen on how to teach intercultural competence in intercultural trainings. The Intercultural Trainer Academy entails the option of obtaining an Intercultural Trainer Certificate upon successful completion of the full 10-day course. Learn more about the structure and content of the Intercultural Trainer Academy by checking the program and course overview. Trainers, who already have experience in training and facilitating learning experiences for groups and would like to deepen their theoretical knowledge and practical skills for an intercultural context. Professionals and/or multipliers, who are passionate about intercultural learning, e.g. teachers or practitioners in the field of international youth work. Advanced university students with an intercultural area of study and international experience, who would like to complement their theoretical knowledge with practical training skills.